So I'm continuing to explore Audible's available Torchwood audio experiences after The Lost Files and it's nice to see that there's actually a LOT of material to go through if you get into this sort of thing. As much as I've theoretically missed Torchwood since the show went off the air, you don't really feel that full until nostalgia really kicks you hard as you listen to members of the original cast reprise their roles. Then you better appreciate what has been missing all this time. Unfortunately this collection overlaps with the stories covered in The Lost Files and I had realized this too late. Bu hey, I don't mind investing in the franchise to show my appreciation for their efforts to tell more stories in their unique side of the Doctor Who universe. Synopsis: Torchwood: The Collected Radio Dramas is an anthology of seven separate BBC audio dramas based on the Torchwood TV series. The show features John Barrowman, Eve Myles and Gareth David Lloyd reprising their roles from the series along with the special participation of other Doctor Who and Torchwood alumni. Lost Souls by Joseph Lidster - People have been disappearing at CERN's Large Hadron Collider at Martha Jones (Freema Agyeman) asks Jack and the Torchwood Team to help investigate. Asylum by Anita Sullivan - Gwen's former police partner, Andy Davidson (Tom Price) encounters an unusual shoplifter who may not be local and he asks Gwen for help to get to the bottom of things. Golden Age by James Goss - While tracking mysterious disappearances the Torchwood team end up in India and Jack is surprised to see that Torchwood India is still standing after he had once closed that branch down back in 1924. The Dead Line by Phil Ford - An odd epidemic of a coma-like trance state is affecting more and more people with Jack Harkness as one of the latest victims and the rest of the Torchwood team has no idea where to begin to find a cure. 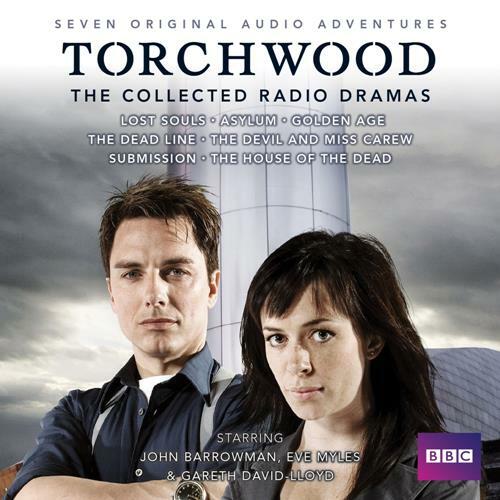 The last three stories, The Devil and Miss Carew, Submission and The House of the Dead were already covered in Torchwood: The Lost Files. What I Liked: This collection has some very solid stories with Lost Souls and Golden Age being some of the strongest. They all nicely showcase how Torchwood worked so well not because Jack saved the day but because the team worked well together to solve each of those cases. Torchwood has always been and will always been a team effort. And the radio dramas were performed as if they were actual episodes and you could really feel the passion for the series in every story. The cast clearly enjoyed working together on this project and that comes through loud and clear in the anthology. What Could Have Been Better: Admittedly the first four stories in this collection oddly felt a lot stronger than the three that had bene in the Lost Files - and I had already enjoyed those stories on their own. Things start strong and end weird when you follow the stories in this sequence and I don't know what the direction was in that regard. Ianto does get a few of those pining over Jack moments that feel a lot more vocal than some of the TV episodes and it gets a little old a times. Yes, I was on the Jack and Ianto ship as well but I wish Ianto had a bit more range other than being all sensitive and sad over Jack inevitably leaving him behind merely by aging. We got that in the show and I expected to encounter it in these stories and I wish that it also came with more. But what can you do with limited run time per episode, I suppose. TL;DR: Torchwood: The Collected Radio Dramas is a great audio experience and a celebration of all the quirkiness that drove the Torchwood series. The acting is pretty spot on and with some great cameos as well. And thus the collection gets a great 5 srange things happening in Cardiff out of a possible 5.